I’m so grateful for this aspect of my job. This week, I had the distinct pleasure of presenting to the Austin Chapter of the Society of Women Engineers on the topic of Navigating Change, one day after this country’s historic election results. Karen Landolt, one of our MBA+ Leadership Program Coaches, engaged this group of 40 smart, professional women in exercises and discussion on this timely topic at Dell’s Parmer Lane campus. Dell and EMC are in the process merging companies, philosophies and cultures, and being aware of something as simple as the difference between Boston, where EMC is based, and Austin’s Dell is so important in forming a more perfect union. 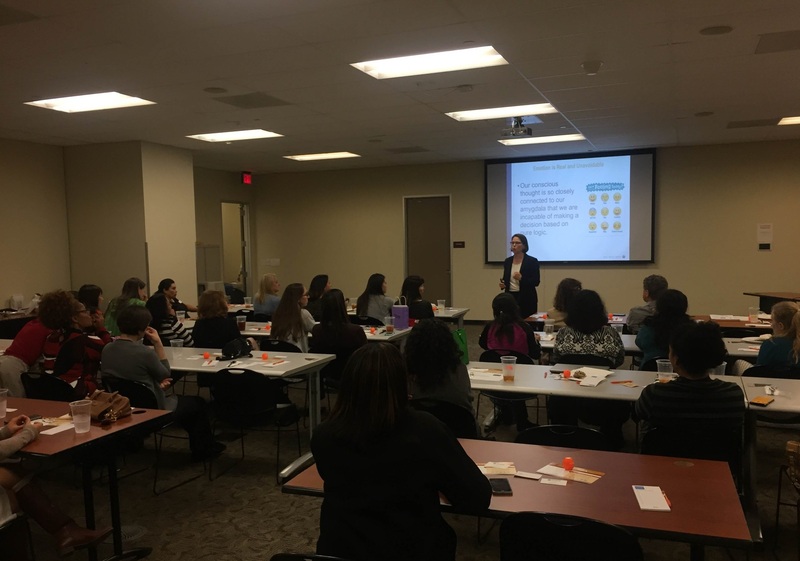 Women in attendance represented a variety of engineering disciplines from a number of well-known companies in the Austin area, and they left with some practical tools to help navigate change in their organizations, their careers and in life. They also had a chance to network with each other and talk to Dell’s career team, as well as learn more about how an MBA can help advance careers not only through academics, but also through co-curricular resources such as the opportunity to receive 16 hours of one-on-one professional coaching from a prudently procured and prolific list of professionals. MBA+ coaches come with expertise in areas such as communication, executive career paths, leadership presence, professional image, improvisation (thinking on your feet), project management, media presence, creativity and innovation, emotional intelligence, and even accent modification among other skills. If you’d like for someone from the Texas MBA to speak at your organization whether it’s a public or private company, or a professional or special interest group located in Houston, Dallas or Austin, please contact me at Sharon.Barrett@mccombs.utexas.edu.